Major General William T. Sherman led three Union armies out of Tennessee in pursuit of Joseph E. Johnston’s Confederate army. Disclaimer: If you click on any of the links below, you will leave American History Central. We do not not certify the accuracy of information, nor endorse points of view expressed on the site to which you are navigating. By early 1864 most Confederate Southerners had probably given up hopes of winning the Civil War (1861-65) by conquering Union armies. The Confederacy had a real chance, though, of winning the war simply by not being beaten. In spring 1864 this strategy required two things: first, Confederate general Robert E. Lee&apos;s army in Virginia had to defend its capital, Richmond, and keep Union general Ulysses S. Grant&apos;s forces at bay; and second, the South&apos;s other major army, led by Joseph E. Johnston in north Georgia, had to keep William T. Sherman&apos;s Union forces from driving south and capturing Atlanta, the Confederacy&apos;s second-most important city. An animated account of the Atlanta Campaign. Requires Adobe Flash Player. A timeline of the Atlanta Campaign. Maj. Gen. U.S. Grant&apos;s victory at Chattanooga was critically important to the Union cause and devastating to the Confederacy. The way to Atlanta was now open. Had that city not fallen when it did, it is very possible that Lincoln would not have been reelected and there would have been a negotiated settlement. After the Chattanooga Campaign Bragg retreated 25 miles south to Dalton, Ga., and entrenched. Grant had not pursued, since he was concerned with going to Burnside&apos;s relief at Knoxville. As a result of public clamor Bragg asked to be relieved and was succeeded in Dec. by Joseph E.Johnston. The Confederate authorities planned a new offensive into Tenn. and, during the winter of 1863-64, reinforced Johnston to a strength of about 62,000, including 2,000 cavalry under Joseph Wheeler. His corps commanders were Hardee, Hood, and (soon after the campaign started) Polk. About 11 o&apos;clock on the night of the 17th of July, 1864, I received a telegram from the War Office directing me to assume command of the Army of Tennessee. It is difficult to imagine a commander placed at the head of an army under more embarrassing circumstances than those against which I was left to contend. I was comparatively a stranger to the Army of Tennessee. The troops of the Army of Tennessee had for such length of time been subjected to the ruinous policy pursued from Dalton to Atlanta that they were unfitted for united action in pitched battle. They had, in other words, been so long habituated to security behind breastworks that they had become wedded to the "timid defensive" policy, and naturally regarded with distrust a commander likely to initiate offensive operations. The Atlanta Campaign, Inc. is a non-profit, living history organization based in Georgia. Their goal is to perpetuate public awareness of, and stimulate interest in, the historical significance of the American Civil War. In the summer of 1864 things did not look good for Abraham Lincoln. On August 28th, he wrote, "This morning, as for some days past, it seems exceedingly probable that this administration will not be reelected." Lt. General U. S. Grant was stalled in front of Petersburg, after several months of horrific fighting with Gen. Robert E. Lee&apos;s Army of Northern Virginia. And Confederate Gen. Joseph E. Johnston had managed to delay Gen. William Tecumseh Sherman&apos;s aspirations for the conquest of Atlanta by the western Federal armies. In the spring of 1864, while Grant was in The Wilderness, William T. Sherman and 90,000 Union soldiers moved southward from Chattanooga toward Atlanta. A smaller Confederate force, about 60,000 men, was under the command of Joseph E. Johnston. Their role was to slow the Union advance and to try to disrupt the lines of supply as Sherman went farther into Southern territory. As the winter of 1863-64 came to a close the Confederacy was facing a grueling challenge on all fronts. In the west, Jefferson Davis envisioned an offensive to dislodge Sherman from Chattanooga, but Joe Johnston [CS] had a more realistic assessment of the situation and planned a defensive campaign, waiting for a mistake on the part of his advisary, William Tecumseh Sherman [US, Military Division of the Mississippi]. Now under the command of his old friend, Ulysess S. Grant [US], Sherman supported Grant&apos;s plan to coordinate the efforts of the individual commanders and bring a rapid end to the war. An accounting of the Atlanta Campaign from the memoirs of William T. Sherman. "War is Hell" - the famous quote attributed to Major General William T. Sherman - was an understatement for the time and a reality for the soldiers of the Civil War. Unfortunately, historians and others have primarily highlighted the tactics of war without considering the logistics. In other words, people have ignored how an army got to the field and survived. 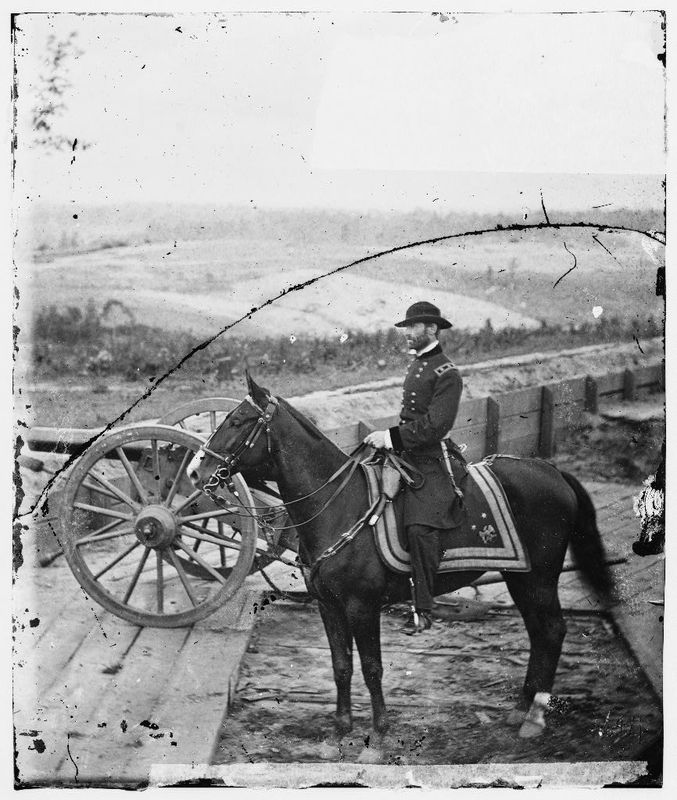 This article will examine the supply system of General Sherman&apos;s army in his campaign for Atlanta, GA.
Get the study guides for history and U.S. politics from Amazon.com and get ready for your AP exams! American History Central is an independent encyclopedia of American history, built on the eCMS platform. GET THE BEST OF AMERICAN HISTORY CENTRAL DELIVERED TO YOUR INBOX! By signing up for this email, you are agreeing to receive news, offers, updates, and additional information from R.Squared Communications, LLC and American History Central. Easy unsubscribe links are included in every email.